Rigid, Impact Resistant clear Acrylic/PMMA (Polymethyl-Methacrylate). 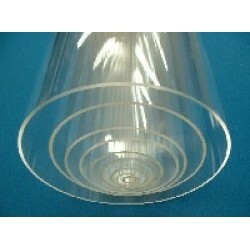 Clear Acrylic Tube 110mm x 3mm x 1000mm Outside Diameter: 110mm Inside Diameter: ..
Clear Acrylic Tube 110mm x 5mm x 2000mm Outside Diameter: 110mm Inside Diameter: ..
Clear Acrylic Disc 110mm x 5mm Diameter: 110mm Thickness: 5mm Colour: Clear ..
Clear Acrylic Tube 110mm x 5mm x 500mm Outside Diameter: 110mm Inside Diameter: 1..
Clear Acrylic Disc 110mm x 3mm Diameter: 110mm Thickness: 3mm Colour: Clear ..
Clear Acrylic Disc 110mm x 10mm Diameter: 110m Thickness: 10mm Colour: Clear .. Mirrored Acrylic Disc 110mm x 3mm Diameter: 110mm Thickness: 3mm Colour: Mirro.. Mirrored Acrylic Disc 120mm x 3mm Diameter: 120mm Thickness: 3mm Colour: Mirro..
Clear Acrylic Tube (please note this is 700mm length) 110mm x 5mm x 700mm Outside Di..
Clear Acrylic Tube 110mm x 5mm x 200mm Outside Diameter: 110mm Inside Diameter: 1..
Clear Acrylic Tube 125mm x 3mm x 425mm Outside Diameter: 125mm Inside Diameter: 1..
Clear Acrylic Tube 70mm x 3mm x 445mm Outside Diameter: 70mm Inside Diameter: 64m..
Clear Acrylic Tube 350mm x 340mm x 310mm Outside Diameter: 350mm Inside Diameter:..
Clear Acrylic Tube 200mm x 190mm x 160mm Outside Diameter: 200mm Inside Diameter:..
Clear Acrylic Tube 200mm x 190mm x 280mm Outside Diameter: 200mm Inside Diameter:..
Clear Acrylic Tube 110mm x 3mm x 235mm Outside Diameter: 110mm Inside Diameter: 1..
Clear Acrylic Tube 110mm x 3mm x 400mm Outside Diameter: 110mm Inside Diameter: 1..
Clear Acrylic Tube 70mm x 3mm x 250mm Outside Diameter: 70mm Inside Diameter: 64m..
Clear Acrylic Tube 80mm x 5mm x 390mm Outside Diameter: 80mm Inside Diameter: 70m..
Clear Acrylic Tube 80mm x 5mm x 440mm Outside Diameter: 80mm Inside Diameter: 70m..
Clear Acrylic Tube 80mm x 4mm x 485mm Outside Diameter: 80mm Inside Diameter: 72m..
Clear Acrylic Tube 110mm x 3mm x 420mm Outside Diameter: 110mm Inside Diameter: 1..
Clear Acrylic Tube 110mm x 3mm x 310mm Outside Diameter: 110mm Inside Diameter: 1..
Clear Acrylic Tube 110mm x 3mm x 430mm Outside Diameter: 110mm Inside Diameter: 1..